Solution: Number of Mangoes in each basket = 8. Price of each Mango = $ 2.13. Hence the price of the basket = $ 17. 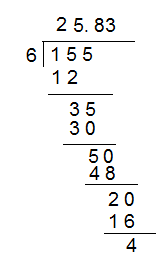 What is the answer for dividing 155 ÷ 6 to the tenth decimal place? a) 25.83 b) 25.8 c) 25.9 d) None of these. Here 155 is the dividend and 6 is the divisor. While dividing the quotient is 25.83. For rounding to the tenth decimal place the number to the right of the tenths place need to be check. Here 3 < 5. So while rounding the number place a zero in the hundredth decimal place. Hence rounding the number to the tenth decimal place value = 25.8.